Protests are being organized and threats to stall the proceedings of next Lok Sabha session are being dished out to oppose the Home Minister Sushil Kumar Shinde’s statement about the Hindu terrorism, its links with BJP and RSS. (23 Jan 2013). There are two major components of this statement. One is the use of the prefix Hindu for terrorism, and two about RSS-BJP links with terror training camps. What Shinde called Hindu terrorism has also been called Saffron terrorism or Hindutva terrorism. This prefix is to point out to acts of terror indulged in by the likes of Sadhvi Pragya Singh Thakur, Swami Aseemanand, Col. Prasad Shrikant Purohit, Kalsangara, Sunil Joshi and many like them who were either actively associated with the deology of Hindutva, or even were organizationally associated with RSS. Others were at that time or previously linked with some progeny of RSS like ABVP, Bajrang Dal etc. Many of them were part of organizations like Sanatan Sanstha, Abhinav Bhararat, who again aim at the goal of Hindu Nation or are ideologically inspired by the agenda of RSS. The home minister’s remarks are based on investigations done Anti Terror Squads of different states and by National Investigation Agency. Earlier the announcement was made by the former Union home minister P. Chidambaram, in July 2010, to Parliament that the National Investigation Agency (NIA) will probe the terrorist attacks on the Samjhauta Express and examine the conspiracy behind the attack, including the links of the accused in terrorist attacks at Malegaon (September 8, 2006), Mecca Masjid in Hyderabad (May 18, 2007) and at the Ajmer dargah (October 11, 2007). He had used the word Saffron terror. Various such acts of terror in which these people have been involved have been coming to light from last ten years or so. In 2003, in Parbani, Jalna and Jalgaon districts of Maharashtra; in 2005, in Mau district of Uttar Pradesh; in 2006, in Nanded; in January 2008, at the RSS office in Tenkasi, Tirunelveli; in August 2008, in Kanpur etc. Few of the details of some of these acts are very revealing. On 6th April 2006 two Bajrang Dalworkers died when making the bombs.The place where they died belonged to the RSS worker and saffron flag was hoisted atop the hose. There was also a board of Bajrang Dal Nanded Branch on the wall of the house. In Thane on 4th June 2008, two Hindu Jagran Samiti workers were arrested for planting the bombs in the basement of Gadkari Rangayatan, due to which 7 people got injured. The same group was involved in the blasts in Vashi, Panvel also. In Goa a bomb kept in a scooter went off on the eve of Divali (17th Oct 2009) in Margao. It killed Malgonda Patil and seriously injured Yogesh Naik. Another bomb was detected in Sancoale in a truck carrying 40 youth for Narkasur competition. Both the activists belonged to Sanatan Sanstha. The second aim of this blast was to create communal tension in Margao, which has a history of communal violence. This group takes inspiration from Savarkar (Hindu Mahasabha) and Hedgewar (RSS) and indoctrinates its members into hating Christians and Muslims. On 24th August 2008 two Bajrang Dal activists died in Kanpur, while making bombs. The Kanpur zone IGP S.N. Singh stated that their investigations have revealed that this group was planning massive explosions all over the state. Indian Express, 23 Oct 2008 reports that those involved in the bomb blast in Malegaon and Modasa (Sept 2008) had links with Akhil BhartiyaVidyarthi Parishad. Similarly in Tenkasi, Tamil Nadu pipe bomb attack on RSS office (Jan.2008) was projected to have been done by Jehadi Muslims. The common pattern of these acts of terror has been twofold. One, that in few of such cases the activists related to Bajrang Dal or fellow travelers were killed while making the bombs. Second these acts of terror were targeted to kill the Muslims, so these acts were organized at times when the Muslims congregations take place, at the time of namaz or festivals like Shab-e-Barat in Malegaon, or in Ajmer Sharif where they come in large numbers or Samjhauta express where the major number of travellers is Muslims. While in the initial phase police authorities working under the prejudice that ‘all terrorists are Muslims’ misdirected their probe, the probe came on the proper track after the Malegaon blasts when the motor cycle of Sadhvi Pragya Singh Thakur, the former activist of Akhil Bhartiya Vidyarthi Parishad, a wing of RSS, came under the scanner and her links with many of those who have been named above and are currently in jail, came to the surface. These facts came to light due to the initiative and immaculate investigation done by the then chief of Maharashtra ATS, Hemant Karkare. Karkare pursued the investigation professionally putting together the threads due to which today most of them are in jails. While pursuing these investigations Karkare came under immense pressure from the politicians belonging to BJP and its close cousin, Shiv Sena. During this time Narendra Modi said that Hemant Karkare is an anti National, (*Deshdrohi*) and Bal Thackeray in his Saamana wrote that’ we spit on the face of Karkare.’ Later Karkare got killed in the Mumbai terror attack of 26/11, 2006. The people involved in some way were associated to the affiliates of RSS or RSS itself. Mr. Singh, Home secretary has given some of the names from RSS stable who have been allegedly involved in acts of terror. Uttarkashi and Sajhapur from 1990s to 2006. Lokesh Sharma (arrested) He was RSS ‘nagar karyavahak’ in Deogarh. Kalyan Parishad” in Dang, Gujarat in 1990s to 2007. Devender Gupta (arrested), was a “RSS pracharak” in Mhow and Indore. Ramji Kalsangra (absconding), was a “RSS associate”. While some beans were spilled by many of these accused the whole picture was pieced together by Swami Aseemanand, when he decided to confess in front of the magistrate. In his confession Swami gave the details of the whole set up raised under his coordination and involving many RSS workers and their associates. The major reason for this whole planning as per him was to counter the Islamic terrorism as witnessed in Sankat Mochan templeetc. and second goal of theirs’ was to pave the path of Hindu nation. The later investigation of ATS and now NIA has unearthed the linkages due to which these activists are cooling their heels in jails. Meanwhile in the wake of most of these terror blasts many a Muslim youth were arrested, some of whom were later released for the lack of any credible evidence. So this whole series of terrorists are Hindus. Does this then justify to label this type of terrorism as Hindu terrorism? By no means! Shinde is wrong to label this terrorism as Hindu terrorism. Is the term ‘saffron terrorism’ correct? No way. This term was used by many including the then Home minister P. Chidambaram in the wake of the investigations done by Hemant Karkar in the case of Malegaon blasts. While one does not approve the term Hindu terrorism or saffron terrorism at all, one will like to see the background in which this term came to be used. The RSS routinely adopts resolutions seeking to “curb Islamic terrorism with an iron hand”. The term Islamic terrorism was first coined by American media in the light of 9/11 act of terror. This was the first major attempt to label an act of terror with religion. This became the most popular word and all and sundry resorted to this word time and over again. This was a deliberate mischief by US to target the Muslims and thereby get legitimacy to launch attacks in the West Asia to control over the oil resources. In India also large section of media picked it up. RSS and its progeny in particular highlighted the religious nature of this terrorism, and the word Jehadi terrorism was the common one to be used. In a way associating terrorism with religion became a dominant norm and it became part ofpopular perception. In this backdrop when the acts of terror done by many Hindus came to light, it somehow came to be labelled with prefix Hindu or Saffron. Term Islamic terrorism and Jehadi terrorism is as much wrong as the term Hindu or saffron terror. The right word for first one may be Al Qaeda type of terrorism and for the second, Hindutva terrorism. Here again using Hindutva terrorism is fraught with some misunderstanding. As such Hindutva is a politics aiming at creation of a Hindu nation but due to its containing the word Hindu in it, it is also taken to be a religion in popular understanding. So the dilemma for Shinde! How to label this group of terror deeds? Probably one will like to make it clear that it is Hindutva terrorism, it has nothing to do with Hindu religion and the difference between the terms Hindu (a religion) and Hindutva (a politics) needs to be made clear in popular parlance. So it’s hypocritical to make the intense noise while the word Hindu-saffron terrorism is used. Same set of people are using the word Islamic terrorism, Jehadi terrorism and propagating that all terrorists are Muslims. One has to know that the phenomenon of terror has been promoted in the Madrassas specially set up by America in Pakistan to indoctrinate the Muslim youth and bring up Al Qaeda type formations. So why demonize Islam, Muslims and use the term Jehadi terrorism? Both such abuses of religion run parallel to each other. What about the statement that training camps run by RSS and BJP? In all fairness one conceded that the training camps run by RSS have gone to give the training in rifles but the training centres of bomb making and use are not directly conducted by RSS-BJP. Surely these activities are done by those associated with RSS-BJP. One can’t take lightly the picture making rounds on social media, which shows Rajnath Singh and Shivrajsingh Chowhan with Sadhvi Pragya Thakur. One also can’t dismiss the fact that Lal Krishna Advani and Sushma Swaraj had gone to see the prime minister to plead the case of Pragya Singh Thakur in particular. One cant ignore that those running these training camps had or were associated with RSS in some way, actively at that time or in the past. So all this protests and threats of BJP, threats to disrupt the session of Parliament are their usual political tactics and do not have any meaning, as their indirect or direct association with the terrorists is so much obvious. What Shinde is stating is factual but terminology is confused, and that’s not due to his own fault. 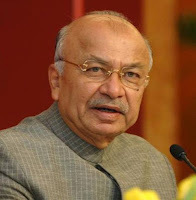 We as a society have not been able to come to coin correct terminologies for different acts of terror anyway, so why get away with using the word Jehadi terrorism and haul Mr. Shinde to the coals for such a use of the term.? Viswaroopam: Kerala Shows The Way!